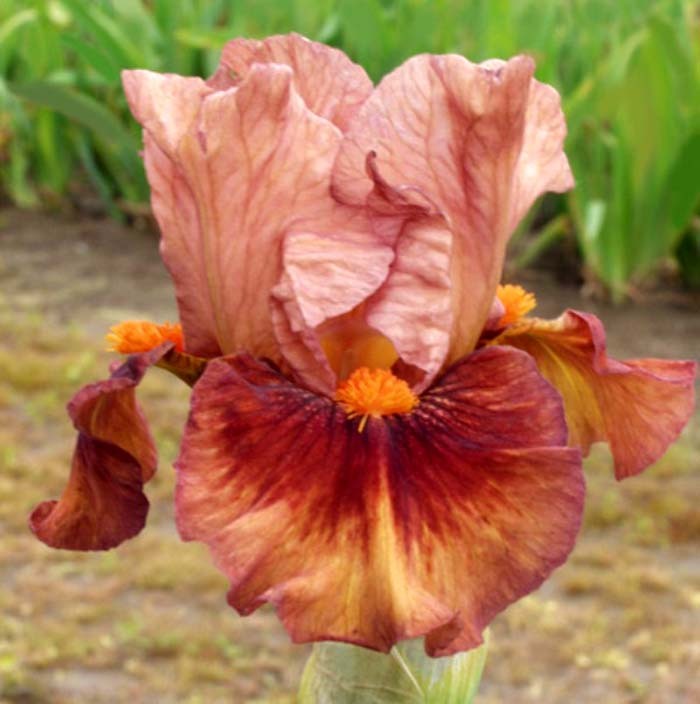 'Safari Sunrise' (Keith Keppel, R 2011) Seedling #01-36G. IB, 26" (66 cm), Midseason bloom. Standards rose amber (M&P 12-B-9) blended rose (4-F-9); style arms slightly more golden tan (11-D-8); falls apricot (10-F-7) blending to marsh rose (4-HI-9) at edge, large arabian red (7-L-6) to kazak (7-L-9) spot; beards flame (1-C-12). Seedling #94-10D, 'Ruby Slippers' pod parent, X 'Safari Sunset'. Keppel 2011. From Keith Keppel Iris catalog, 2011: SAFARI SUNRISE M 26 " (((Candy Floss sib x Orange Tiger) x (Orange Tiger x Chanted)) X Safari Sunset). Desert colors: rose and rose amber blended standards, style arms touched golden tan, falls apricot blended rose at edges. But what sets off everything is the large arabian red fall area and flame beards. Another needing no label for identification! Two branches, four buds. #01 -36G. $20.00. jpg BHP_8859-X2_safari_sunrise.jpg manage 210 K 12 Feb 2016 - 04:49 BrockHeilman Please contact Brock Heilman for image use.